Gone are those days when we used to collect cassettes and CD’s of our favorite artists and tracks. With online music streaming services, our experience has become much more delightful. There’s a big advantage of choosing online music services over any other medium. Google Play music is one of the best online music platform with a library of over more than 1 million soundtracks of various genres. But if we compare its hype to other Google services, it’s a bit underrated. Well, on the contrary you can’t find anything better than this! Google Play music is an amazing platform which combines Spotify-like subscriptions and Pandora-style radio stations. In addition to this it has some excellent features which most of us have overlooked. So, let’s get started and explore these 6 useful tips and tricks to enhance our music listening experience. We’re all aware of Shazam, right? But did you know with Google Play music loaded on your phone, you don’t need Shazam at all. No kidding here! Google Play music comes with an inbuilt feature that identifies song tracks playing near you and provides you song info within a jiffy. The app will first ask “Identify what’s playing?” and then as soon as you tap on this, the app will start listening to music that is playing around you and will identify, and retrieve the song details to you. Why just listen, when you can watch too? This is one huge advantage that comes along with Google Play Music. If you want to watch the music video for a song you’re listening to, tap the YouTube-shaped icon in the player window on the mobile or web apps and the video will start playing. Most of us have a habit of listening music during bed time and fall asleep while listening to our favorite tracks. But once we wake up our phone’s battery is almost drained which is quite annoying! So, to avoid this Google Play Music allows you to set a sleep timer which’ll pause the song after a certain period. To improve your playlists with better sound tracks, Google Play Music allows you to pick your favorite artists and genres to build a specially curated playlist for you. Based on these recommendations and by answering a few quick questions you can get all your favorite tracks under one roof. To do so head on to settings> General section. Now tap on “Improve Your Recommendations”. Google’s advanced machine learning algorithm will then get to work and offer you the best soundtracks as per your taste and preferences. If you want to start fresh and want Google to forget everything about your music tastes and preferences, then you also have the option to wipe off your music history. Head on to the settings section in the app and tap on “Delete Recommendation History” to make Google forget everything it knows about your musical tastes. When it comes to playlists Google Play Music handles it in bit different way. One you tap on any playlist, it copies the entire songs of that playlist on your current queue which gets a bit messy to handle. So, if you wish to reorder these songs based on your music taste and preference, here’s what you need to do. Tap the Queue icon (the orange musical note icon in the image above) and you can see and rearrange everything that’s been added to your list. 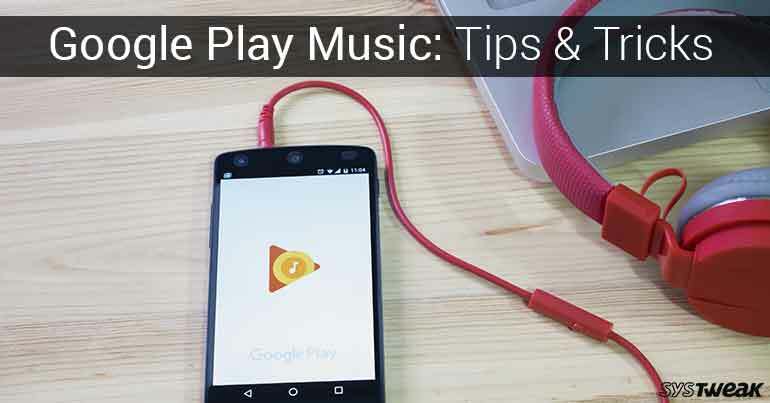 Hope you liked these useful Google Play Music tips and tricks. All in all, Google Play Music is a great experience—a decision which you surely won’t regret!